The treatment of fixed cervical deformity is complex, but the principles guiding its correction remain the same as in deformity of other spinal regions, with the goal of deformity correction that results in a solid fusion with adequate decompression of the neural elements. In these challenging cases, osteotomies are necessary to mobilize the rigid spine and to obtain the desired correction, but they can be associated with increased risk of complications. Therefore, careful preoperative planning and a complete understanding of the anatomic variations allow patient-tailored approaches with and case specific techniques for the optimal and safe treatment of a variety of complex cervical deformities. 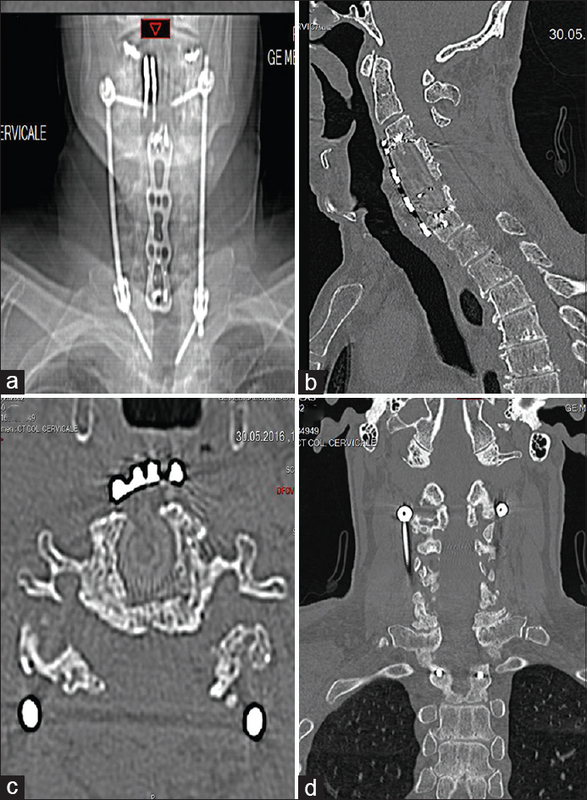 We present a case report with a complex spinal deformity where a 3D model was used for surgical strategy that allowed us to “simulate” the osteotomies and get a better correction of the cervical deformity. It represents a promising research and clinical area that could be used to improve and facilitate greater quality in diagnosis and presurgical planning. 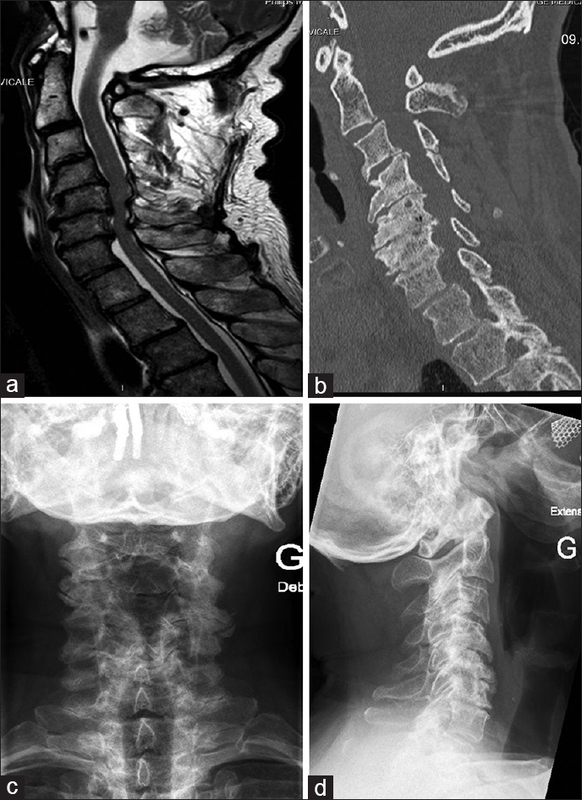 We present a case of a 66-year-old male, diagnosed with a mild cervical myelopathy associated with a fixed cervical kyphotic deformity. Surgical decompression and deformity correction were recommended three staged surgery was planned [Table 1]. The cervical CT images of the patient [Figure 1]a,[Figure 1]b,[Figure 1]c,[Figure 1]d are imported into the Mimics Innovation Suite (Materialise NV, Belgium), a commercial and certified medical imaging manipulation software suite [Figure 2]a,[Figure 2]b,[Figure 2]c,[Figure 2]d,[Figure 2]e.
After defining the appropriate density range (between 226 and 1872 Hounsfield units), the bone is precisely segmented using an automatic thresholding tool. Then, the algorithm interpolates all 2D masks to generate a 3D model of the cervical spine. This model is then “edited” to include only the specific region of interest, to make it suitable for 3D printing [Figure 2]b and [Figure 2]c. The final model [Figure 2]d,[Figure 2]e,[Figure 2]f, ready to be 3D printed, is exported in the Standard Tessellation Language file format. The model is then 3D printed with an in-house 3D System Project 3510 SD printer. 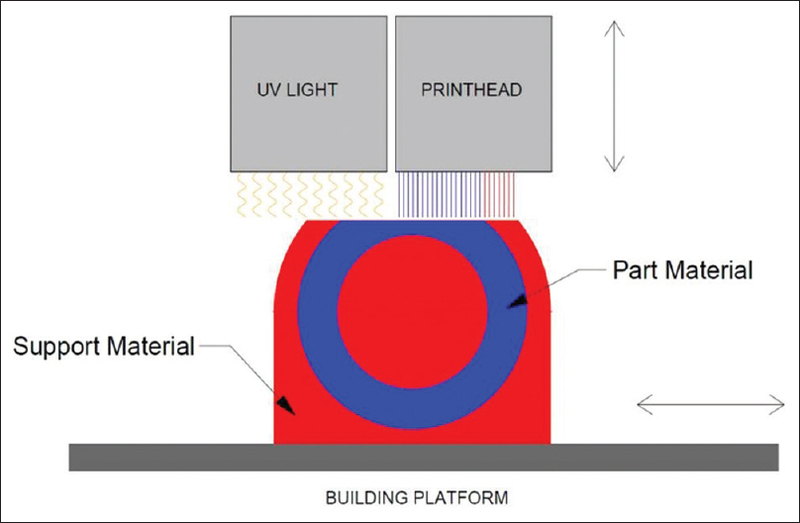 The process consists of jetting and ultraviolet-curing successive layers of proprietary acrylic resins [Figure 2]g, [Figure 2]h and [Figure 3]. The layers have a thickness of 32 μm, and the XY resolution of the printhead is 375 dots per inch. Rigid and translucent resin (Visijet M3 Crystal) has been used to generate the physical model [Figure 2]h. During the process, a paraffin support (Visijet S300) is automatically generated around the part. This support is eliminated afterward by melting at 65°C and the part is manually cleaned before use. Analysis of the 3D model clearly shows the location and extent of ankylosis, in addition to other bone details [Figure 4]. Particular attention is paid to the uncovertebral joints at each level from the anterior surface to the neural foramen. Attention is also paid to the facet joints at each level, particularly on their lateral aspects. Required osteotomies for deformity correction were planned using the fine detail of the 3D model. When compared to conventional MRI and CT imaging, definite ankylosis was identified in several locations, which was not noted on the 2D imaging [Figure 4]d; yellow arrows]. 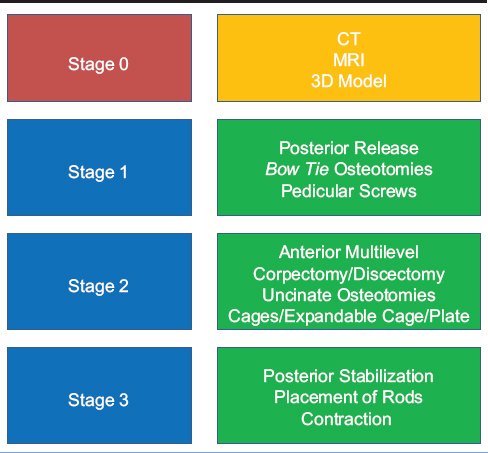 Surgical multilevel osteotomies were planned and based according to the ankylosed points identified previously over the 3D model [Figure 4]a. A two-stage surgery was planned involving placement of cervical pedicle screws and a posterior release. The second stage involved a multilevel anterior release with restoration of anterior column height using an expandable cage and plate, followed by posterior rod placement and posterior column shortening with bone grafting. For the first stage of surgery, a standard midline posterior approach was used to expose from C1 to C7 [Figure 5]a,[Figure 5]b,[Figure 5]c,[Figure 5]d. A reference arc was place on C2, followed by a 3D fluoroscopic acquisition (O arm, Medtronic). Pedicle screws were placed at C3 and T1 bilaterally. Peripedicular “strip-like” osteotomies were performed at C3/4, C4/5, C5/6, and C6/7 bilaterally [Figure 5]e and [Figure 5]f such that there was complete discontinuity of bone posterior to the nerve roots at each level. The wound was then closed. The second stage was performed several days later. The patient was positioned supine initially, and using a “carotid-” type incision, the anterior spine from C2 to C7 was exposed. Multilevel discectomies at C3/4, C4/5, C5/6, and C6/7 were performed using the operating microscope. Uncal release was performed at each level bilaterally initially using a high-speed cutting drill, with the final bone removal laterally performed using an ultrasonic bone dissector as far as the adjacent soft tissues and vertebral artery [Figure 5]f. This completed the 360° bone release, facilitating correction of the malalignment. This technique was used on all involved levels. Midline multilevel trench corpectomies were performed at C4, C5, and C6. A PEEK expandable cage was placed and expanded to restore neutral alignment, confirmed on 2D fluoroscopy. A cervical plate was placed from C3 to C7 [Figure 6]a,[Figure 6]b,[Figure 6]c,[Figure 6]d. The wound was then closed over a Jackson-Pratt deep drain. The patient was turned over to a prone position on the Jackson table, the posterior cervical area was prepped and draped, and the posterior incision was reopened. Rods were conformed to a lordotic curvature, placed into the pedicle screw heads, and secured under fluoroscopically controlled compression to achieve lordosis. Autologous bone graft was placed into the osteotomy defects bilaterally. Neurosurgical planning is a critical step for correct decision-making. Numerous attempts have been made in different fields to understand the pathologies and complex anatomical structure. As a modern concept, we can now compare the current practice that depends on MRI and CT imaging with 3D printed models to augment surgical planning and education. Appreciation of the complex 3D anatomy and corresponding pathology of the spine remains difficult with 2D imaging, such as CT and MRI, even though it remains the standard for the pre- and post-operative evaluation of the spine patient. As 3D printing technology evolves and costs decrease, patient-specific 3D printing may become more widespread and even routine for both clinical and educational uses. Preoperatively, 3D models can be used to improve surgeons' and patients' understanding of related pathology. With much current attention focused on the importance of sagittal balance in spinal reconstruction, such tools can also enhance 3D interpretation and surgical planning. Nemani VM, Derman PB, Kim HJ. Osteotomies in the cervical spine. Asian Spine J 2016;10:184-95. Shamji MF, Ames CP, Smith JS, Rhee JM, Chapman JR, Fehlings MG. Myelopathy and spinal deformity: Relevance of spinal alignment in planning surgical intervention for degenerative cervical myelopathy. Spine (Phila Pa 1976) 2013;38 22 Suppl 1:S147-8. Ames CP, Smith JS, Eastlack R, Blaskiewicz DJ, Shaffrey CI, Schwab F, et al. 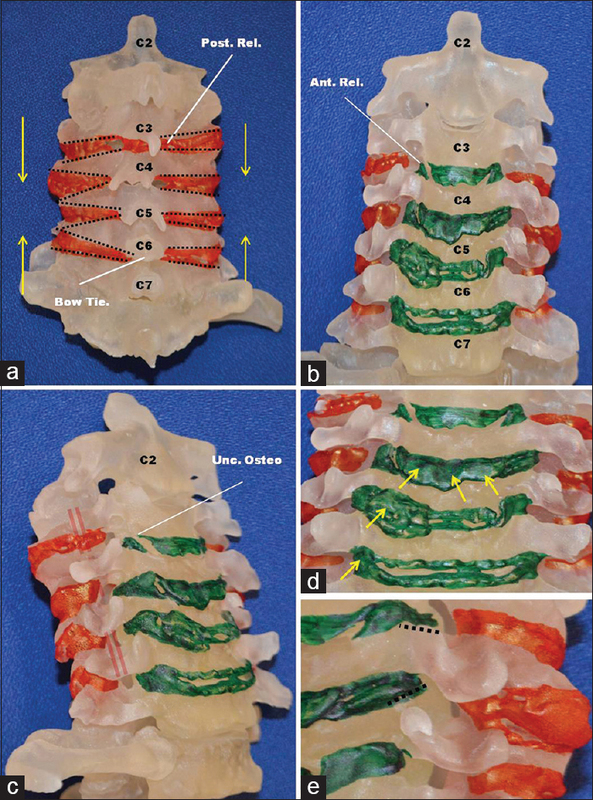 Reliability assessment of a novel cervical spine deformity classification system. J Neurosurg Spine 2015;23:673-83. Ailon T, Sure DR, Smith JS, Shaffrey CI. Surgical considerations for major deformity correction spine surgery. Best Pract Res Clin Anaesthesiol 2016;30:3-11. Protopsaltis TS, Scheer JK, Terran JS, Smith JS, Hamilton DK, Kim HJ, et al. How the neck affects the back: Changes in regional cervical sagittal alignment correlate to HRQOL improvement in adult thoracolumbar deformity patients at 2-year follow-up. J Neurosurg Spine 2015;23:153-8. Hoarau R, Zweifel D, Simon C, Broome M. The use of 3D planning in facial surgery: Preliminary observations. Rev Stomatol Chir Maxillofac Chir Orale 2014;115:353-60. Liew Y, Beveridge E, Demetriades AK, Hughes MA. 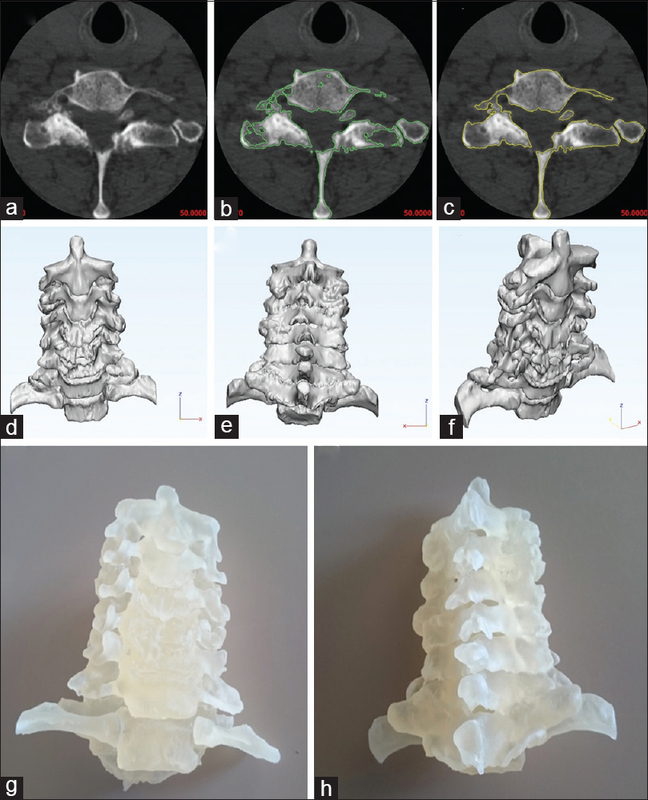 3D printing of patient-specific anatomy: A tool to improve patient consent and enhance imaging interpretation by trainees. Br J Neurosurg 2015;29:712-4. Sharan AD, Krystal JD, Singla A, Nassr A, Kang JD, Riew KD. Advances in the understanding of cervical spine deformity. Instr Course Lect 2015;64:417-26. 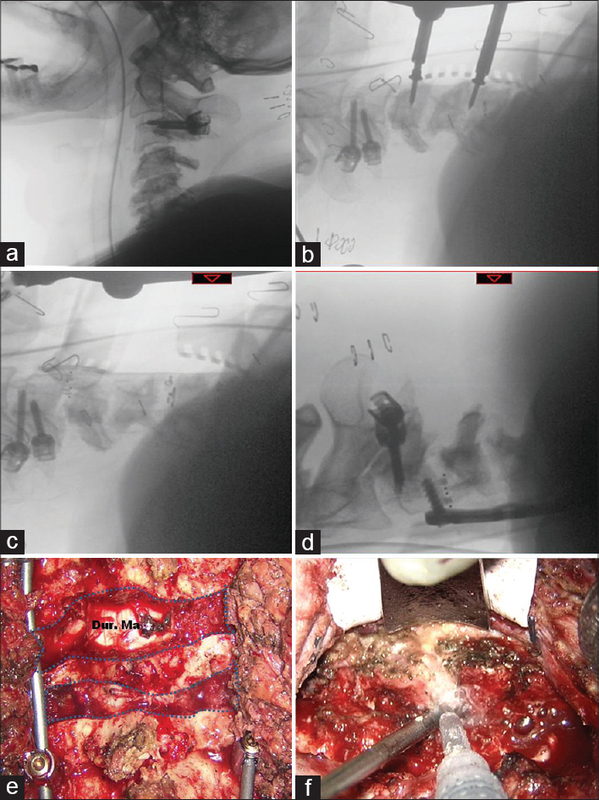 Sembrano JN, Santos ER, Polly DW Jr. New generation intraoperative three-dimensional imaging (O-arm) in 100 spine surgeries: Does it change the surgical procedure? J Clin Neurosci 2014;21:225-31.